What are the best responding to criticism quotes? And how do you respond to criticism? Do you retreat, run or react? You know what it’s like. You’re just living your life, doing your thing and then out of nowhere someone comes at you with very intense language scolding you. For reals though, it’s startling at first. Especially when the criticism comes from someone you don’t even really know or is a complete stranger. Troll much? Where’s the constructiveness in that? And is it different, or should you feel differently when that criticism comes from someone you know and dare say love or are friends with? Should well-meaning criticism be well received? 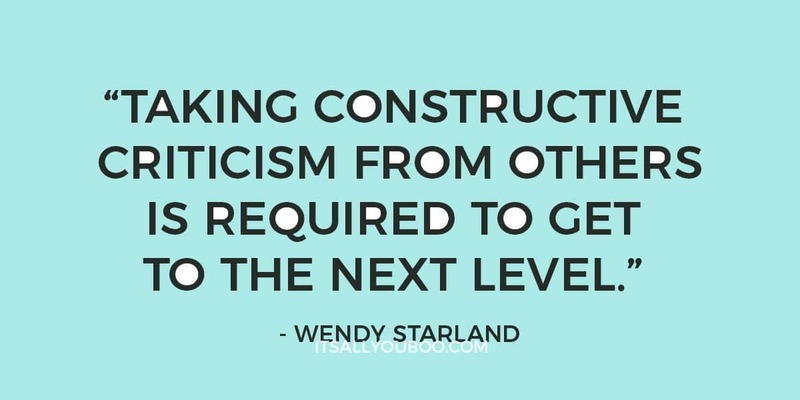 How do you handle constructive criticism? Can criticism even really be anything but destructive? I’ll be honest, I usually don’t react well in either case. Maybe it’s just been too many years since I’ve had a professor or TA red pen my papers so I’m just out of practice. My initial reaction to criticism is usually not the best and I go straight to defense. “Why? No… It’s not, I’m not.” Fighting for my honor like I’m pleading in court. 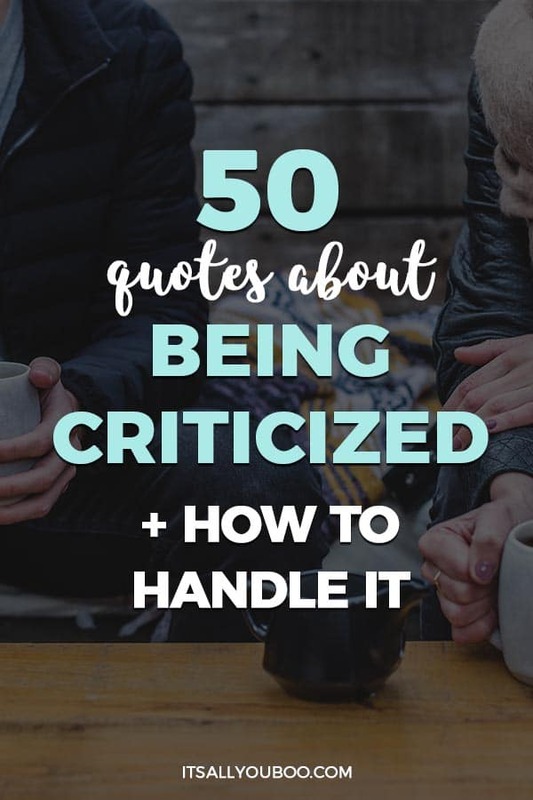 So, to deal with my “criticism of criticism” issues and to learn how to take criticism I’ve collected 50 quotes about being criticised and how to handle criticism. And you can learn to deal with criticism more positively too. You can’t avoid criticism. No matter what you do, someone is going to have an issue with you. You handle criticism by realizing it’s not personal, it’s just part of doing your thing. 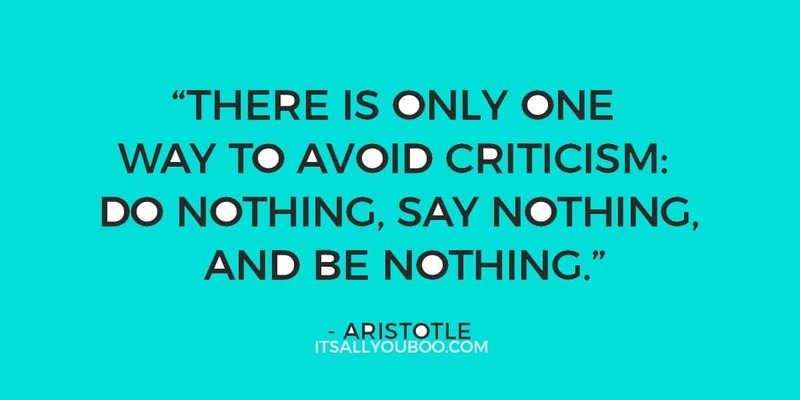 The only way to not receive criticism is to do nothing, never try and be no one. 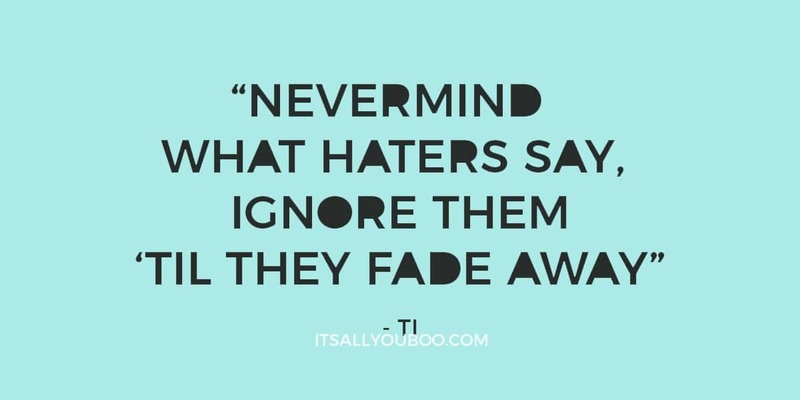 Haters gonna hate, that’s what they do! Expect it, and ignore it. Once you refuse to be offended by or even take notice of what they say you can’t be hurt by it. 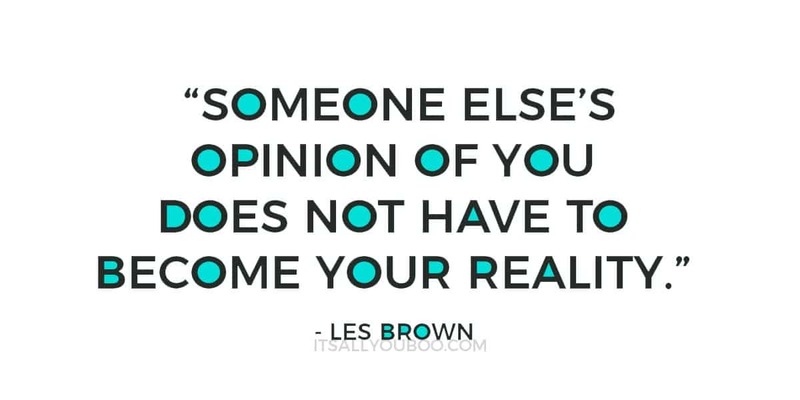 Have confidence in yourself and don’t let it taint your reality. True self-esteem and a strong sense of self-worth come from within, not without. 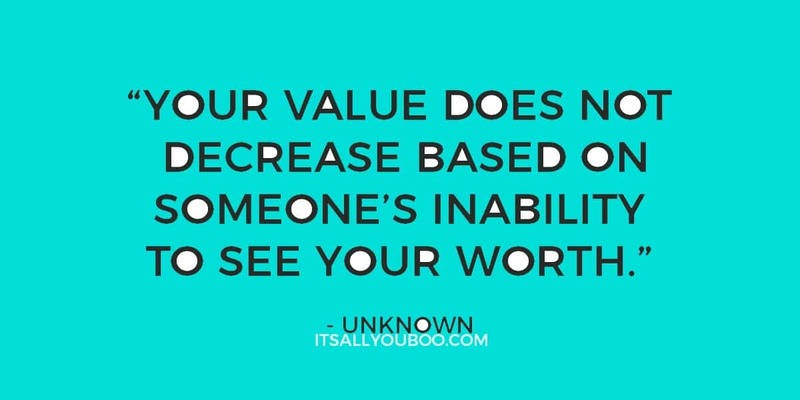 Whether or not someone values you or thinks well of you or not, can’t impact your value. Only you can do that. Ouch, criticism can be harsh sometimes (even if it’s “valid”), so how to take it? It’s all about how you react and respond if you choose to. Give a compliment, smile, be kind, don’t get defensive. Always consider who and why you’re being criticized, and learn from it you can. If not carry on! Everyone who has done anything in this world has been criticised or worse. 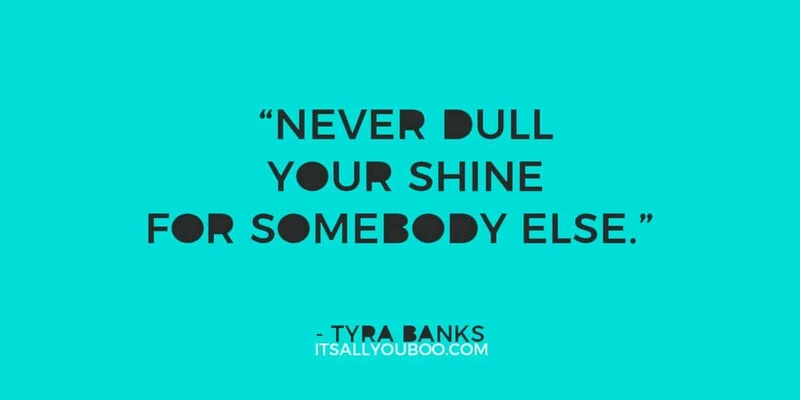 Not everyone is going to get what you’re trying to accomplish or be able to stand by you. Don’t ask for permission and ignore their little minds and don’t let it diminish you. Don’t do it for praise or for criticism, do it for yourself. Praise and criticism are opposite sides of the same coin, either way, don’t let it get to your head or your heart. Praise can sometimes be as harmful as criticism if you don’t take it well. 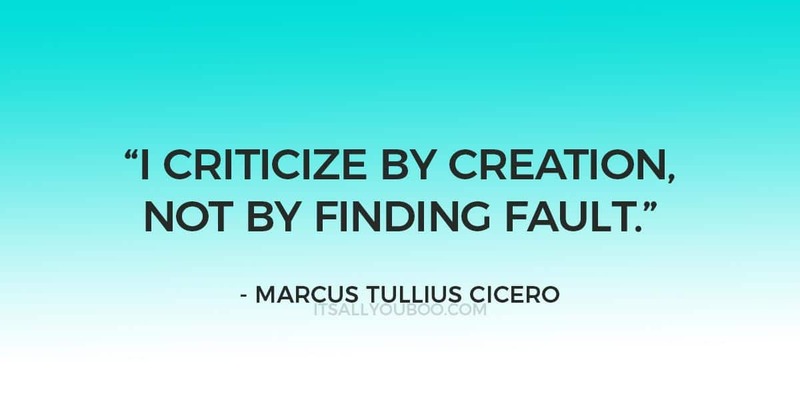 Not all criticism is “bad” or harmful. Criticism can drive you to be better, stronger, but when delivered gently and with the aim of being constructive, not destructive.  RELATED POST: Do You Need a Champion Mindset? If you must criticize, be sure you’re doing it with the right heart and with the intention of helping. Do not criticize what you do not understand or have no experience in. When giving constructive criticism, be sure to deliver with praise. Greater change and progress comes from being encouraged than by being criticised. Surround yourself with those who encourage you and give encouragement rather than criticism to those in your life. Even if a criticism you receive is negative and destructive, it’s how you handle the criticism that matters. No matter what criticism you receive or from whom, it’s your reaction that counts. You cannot control what anyone says to you, not a superior or boss at work, not a client or customer if you’re an entrepreneur, and definitely not a stranger and internet trolls. But, you can control how you react, receive or return it and respond to criticism. But, dealing with criticism positively is only possible if you’re good with you, confident in what you’re doing and going to keep on keeping on no matter what opposition, criticism and hate mail you receive. 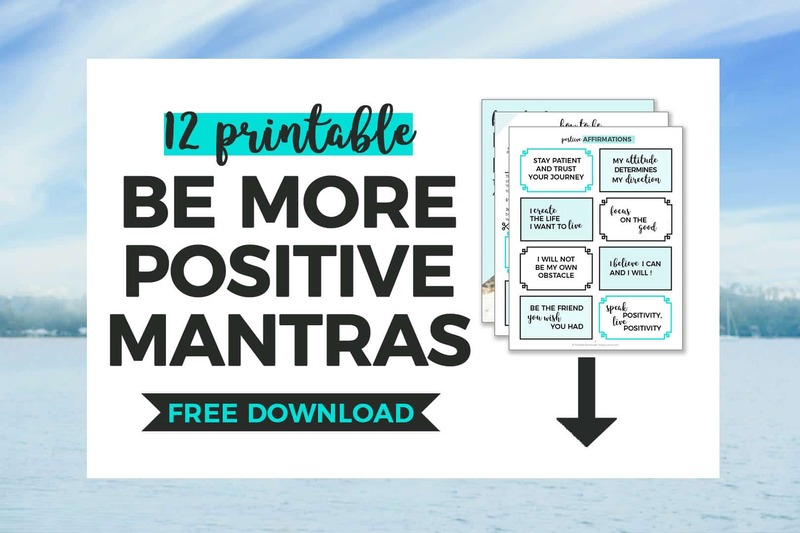 Sign up below, plus get 12 Printable Affirmations to help you stay positive no matter what anyone says to you. Sign up below for FREE Printable Affirmations + weekly tips to help you slay your goals. Mantras are an amazing way to train your mind to focus on the positive (or build up your “positivity instincts”). The more you say them and repeat them in your mind the more natural being positive, and reacting positively in the face of criticism becomes. Just print, cut and keep these positive affirmations where you can see them. From on your office wall, as a bookmark, or taped to the side of your monitor or ever to your bathroom mirror. Remember, it’s all about your mindset and perspective, be good no matter what criticism you face. When you’re good with you, it doesn’t matter what anyone says to you. Subscribe to our VIP newsletter, plus get the free affirmations. I usually take it with a grain of salt unless it’s someone’s opinion I truly care and value. I don’t mind constructive criticism, I’d like to be more positive so thank you for the lovely affirmations! Yes – grain of salt indeed. But sometimes even a grain can sting if you’re not prepared or truly good with yourself. I am horrible at accepting criticism. I always react negatively. I really need to take it as a learning experience and grow from it instead. Girl me too! The worst, but I’m trying to be better. I’m right there with you, which is why I went quote hunting to learn how to take it better. How I deal with criticism often depends on my mood. I’m trying to be more self-aware when criticized. These are neat quotes. I need to print a few off and tape up around in different places. That makes sense, a good day, in a good mood, where no one can rain on your parade vs. just having a downhill day could make all the difference. Yay, I love decorating with quotes. Clearly, you can tell I’m obsessed with them. There are days that I can totally handle criticism but then other days I just get angry. I konw that is not a great reaction but sometimes it feels like people are jsut being rude or mean. These quotes are really helpful and make me think of criticism in a different way. Totally, just like Melanie said, it’s all about the mood you’re in. Sometimes I’m flattered to be criticised, like oh me, thank you! Other times I’m like why are you on me right now. It’s true, sometimes they’re just being a troll. Dealing with criticism is so hard sometimes. I think I try to ignore because I hate to show people how I feel. Which is not always a good thing. This is a great post to look back at. It can be so hard. I think it’s all about our mindset and our mood when we receive it too. There’s a fine line between ignoring it and letting it go. Who likes being criticised right? No one, but just letting it not stick or float in our minds for days is the ideal. That’s a powerful quote. It’s so true, you set the standard of now only how you’re value but how you’re treated. Set the price SUPER high! WOOT, glad you love them! 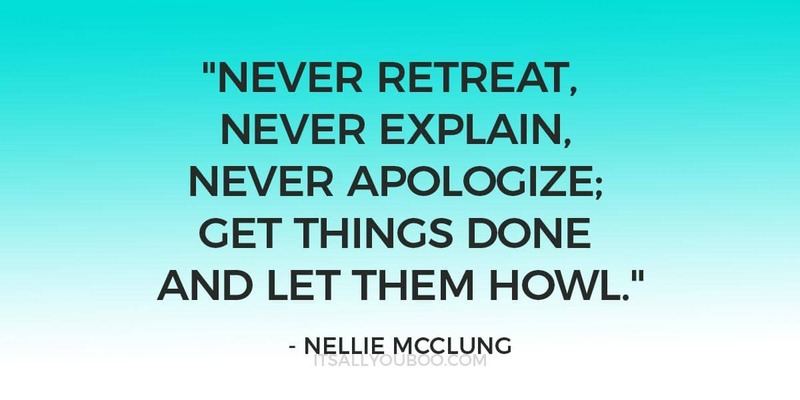 I so agree these are the quotes that helped me when I was reacting not so well to some criticism lately. That’s such a good one! It really is all about how we view ourselves, I think our reaction to criticism is a reflection of that. These are all great words to chew on when faced with criticism. I think my favorite is: “You have enemies? Good. That means you’ve stood up for something sometime in your life.” ― Winston Churchill…but I am also a fan of this “The question isn’t who is going to let me; it’s who is going to stop me.” ― Ayn Rand Great post and I needed it today, so thank you! Happy chewing! I know I am. Right! Winston was such a wise man, I love watching or reading any stories that feature him as a character. Both BIG quotes! This is a great post to share with anyone that feels down. I’ve bookedmarked this page to keep and share as we get closer to the holidays, when people seem to get frustrated the most. Thanks for compiling this! Thanks, I so agree. These quotes help me so much, especially when the sting of being criticized is still fresh. Yay for being bookmarked. OMG yes – Holidays are a joyful and also not so joyful time for people. Great idea! 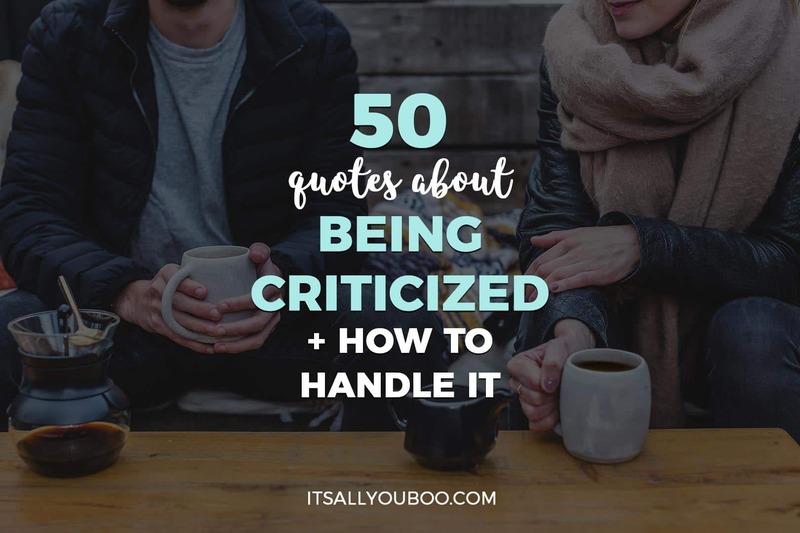 To me, criticism (depending on who it comes from) could be a form of jealousy (that honestly just builds my confidence) or it could be out of love and concern (my husband will give me constructive criticism because he is trying to make me a better person – as everyone’s partner should do). It takes a certain amount of personal strength to handle criticism though. Hahah, that’s an excellent point. A lot of the time I feel like it is. Sometimes I like getting the hate, it makes me know I’m doing something right. It sure does! It’s great that you have someone to help you improve, we all need that. 🙋🏽 Work in progress! You know, for several years, my family and important people in my life didn’t really believe in what I do. Now, I work with several big companies who trust my expertise enough to help them get through their online digital problems. Great things take time and if you take the easy way through life, you’ll never accomplish what you’re meant to. Also, it might help you to look at the person who’s criticizing you and wonder what in their life is missing that they could negatively try to impact you this way? People always tend to put others down when they’re not satisfied with their own lives. Thanks for sharing that. I sometimes wonder if my family believes in me and whether it’s criticism or just a lack of faith on their part. But, the most instances where I prove I’m capable and have those “look mom no hands” moments… the less they judge. (Not that my mom isn’t a full supporter of me). That’s so amazing that you’re like living proof to just go for it, no matter what anyone says when you start. YES, that’s so true. The criticism we give is usually a reflection of ourselves. Yay for being uplifted! Oh no, I really hope you’ve had better days since. I find that it’s hard to stay down after reading some insanely inspiring quotes. To be honest I dont take criticism very well especially about a post I have write. Just recently I posted a post in a facebook mummy group and you cant imagine how much people was hating it. I get what they were saying and I get it now. But some got feed by all the hate and didnt stop…its was bullying! But I guess when you are blogging we have to understand that not everybody will like what you write..
No worries, w all have our moments. Myself included! Oh no that’s the worse. You should be able to put yourself out there, share what’s in your heart and how you feel without getting dumped on by the Facebook mob. I’m so sorry that happened to you. Keep an open heart, your tribe is out there, that won’t judge but welcome you. #40 is so perfect. Sometimes it’s easier to remember the criticism than the compliments. Thank you for the positive push this Friday. BIG QUOTE! It makes me double take anytime I consider being harsh or criticising someone. Compliments > criticism for sure. They’re more effective. I can take criticism depending on who, what and how or why it’s being said. It’s nit necessary to put your two sense in all the time. If my supervisor states something I take it as a tip for better performance. If it’s my makeup job by a stranger I may not take it as a helpful tip depending on how it’s said. I think criticism is meant to help but it’s how it’s delivered makes us perceive it differently. That’s a great point – delivery is everything. And not everyone has mastered the art of giving constructive criticism. These are great points to consider and remember. Accepting criticism is difficult but considering the source and looking for ways to be positive and improve are what I like to focus on. It can be difficult for sure, but it’s just a part of doing this. You get criticism and hate, it’s just part of the job. And I so agree with you, you have to look at the positive and focus on that instead of any negativity you’re receiving. These are great I save some to use for later. 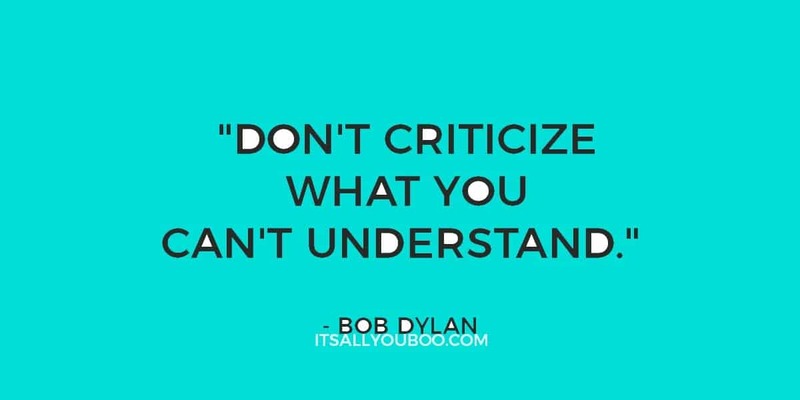 Being Criticized can be hard and so unnecessary sometime! I get really touchy when my family and close friends criticized me, really to care what other people think. Yay for saving quotes for later. I find they’re great remedies for when you’re down. It can be ssssooo hard and totally unnecessary! Sometimes people don’t feel good unless they’re putting or pulling someone down. Me too! But I’m trying to be better at taking it and not caring regardless. A “thanks for your concern, but I’m good” approach. Inspiring post! I have a related quote! “Humility is a virtue for those who don’t have any other.” – My ex’s sister. Thanks for sharing! I like it! 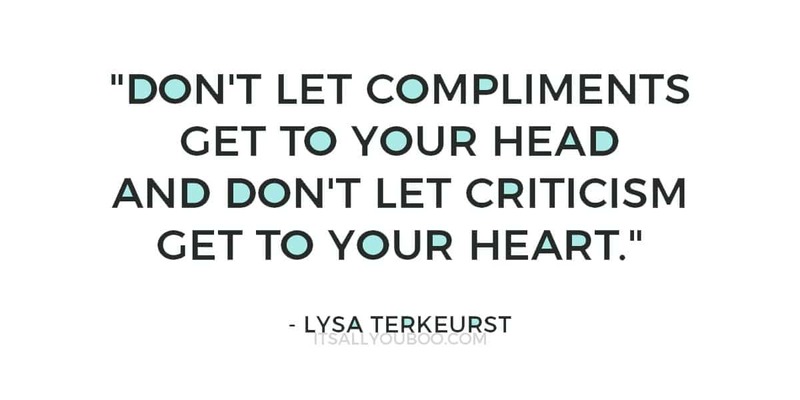 I love Lysa Terkeurst’s quote “don’t let compliments get to your head; and don’t let criticism get to your heart.” Yes and amen. Sometimes we have to just step back and observe objectively what the comments mean/don’t mean. And then move forward. Yes and amen indeed. It’s so simple, yet such a powerful statement. Either way, you’ve gotta stay focused and not get distracted or derailed by either. I tend to be defensive when people get critical as well. So I understand where you are coming from. That makes complete sense. That’s good that you are being constructive about it and finding great quotes. I really do like the quote by Churchill. To be disliked means. you stood up for something you believed in. This is important. Totally, “shields and engage deflectors”! Thanks, that’s usually how all my quote posts start. Right! Love it, it gives such perspective. Now being criticized feels like an honour, I know I’m doing something right. Wonderful post .A very difficult topic to handle with grace.Loved all the quotes. Thanks for the blog love! That’s a beautiful way of putting it, responding to criticism with grace. I’ma aspiring to that for sure. I think majority of people take criticism as personal . This is indeed an interesting post and I really learned some good ways to handle it. It’s hard not to, but I think it’s a skill and the more aware we are of our reaction and knowing we don’t need to have one, helps us get better at it. This is such an amazing list of criticism quotes! My personal favorites are of Aristotle and Winston Churchill quotes. If people criticize me, I try to take it positively. If it is very offensive, I try to let it go and concentrate on other things in my life. Because at the end of the day, I can’t make everyone happy! Thanks Ana! Glad you enjoyed it. I’m such a fan of Winston Churchill. I love him more the more I learn about him and see him in period pieces. Criticism is not easy to handle. It is more about the person who passes the remarks that the one playing victim. Thanks for some really great quotes here. It sure ISN’T! But I think if we practice mindfulness and learn as we react, we can get better at taking it. I tell myself that it’s usually NOT about me, but about them. This is such a great post, seriously. I don’t get criticized much so when it happens I always feel like I’m not fully prepared on how to react. I usually under react and then feel frustrated afterward. This was definitely a helpful read. I feel like even when it happens on the regular, you’re almost always surprised. Like what, who me? It’s nice to be level-headed about it though. I find these quotes helpful for that. This was a timely post and definitely much needed. I enjoyed reading your valuable thought process on criticism. Thanks so much for sharing. Glad you find it helfpul! I know for me these quotes helped me cool off after taking some not so find words haha. Ha T.I. quote is my favorite one on the list! It seems like everyone is critical of everyone but as individuals we cannot let our energy be drained by people speaking negatively of you. It’s so true too right. Somehow the voices of criticism do fade away when you ignore them. We can’t let it drain us, like you said. I am so bad at taking criticism but I know I need to be able to take constructive criticism to become more successful but it’s so hard to not take it personal. Thank you for help! Girl me too! Trying to be better though. So hard… but thankfully these quotes really help put criticism in perspective.